Make your space stand out for all of the right reasons with a new set of floors. When you are ready for a change in your home, shop with us for laminate flooring in Santee, CA. Our store features a complete collection of laminate tile flooring in styles that fit every room theme. At our local showroom, we feature bold and durable products for spaces of all sizes. Our goal is to help you expand your décor without overspending on materials. Visit us to discover your options. When it comes to installing first-class flooring in your house, our flooring store has what you need for an affordable price. We offer a wide inventory of name-brand flooring that will transform and upgrade your home. Our laminate floors are tough and easy to maintain, and our collections of laminate flooring complement a variety of interior design preferences. Whether you have an idea of how you want your home to look or you need a little inspiration, choosing laminate tile and laminate wood flooring will give you the style you want for less. This versatile flooring option adds elegance to every space without the need for regular maintenance. What Makes Laminate a Suitable Option? Laminate flooring is available in a series of styles for every room, as well as a level of quality and durability that is unparalleled on the market today. Our showroom features laminate in a vast assortment of beautiful finishes that matches the style and decor of any home. By turning to us for your purchase, you will have access to a number of options from top brands like Floorcraft. The unique structure of laminate wood flooring helps to prevent warping, stand up to water, and create a natural-looking appearance. Laminate tile and plank are both top choices for those who love the look of harder flooring surfaces but don’t want to break their budget or deal with special maintenance needs. Laminate flooring can be made to realistically imitate the appearance of natural stone and other materials. Do you suffer from allergies or asthma? Laminate tile flooring is an excellent flooring choice for anyone with respiratory problems because it doesn’t trap dust, dander, pollen, or allergens like other types of flooring do. Its easy-to-clean surface means dust and pet hair can be quickly swept up so it doesn’t hang around and make you sneeze and cough. Make the best choice for your family by choosing these floors during your next home improvement project. If you or anyone else in your house suffers from allergies, respiratory infections, or asthma, this flooring can provide protection and relief from breathing aggravation. Laminate is a perfect choice for virtually any room of your home due to its attractive appearance, water resistance, and easy maintenance. Instead of spending your free time cleaning dust from your floors, choose laminate flooring for an easy maintenance option. Laminate flooring is built to last with regular use. At our showroom, you will find laminate tile flooring and laminate wood in styles that will fit every preference. No matter what your personal tastes are, we have the perfect product in stock to bring your ideas to life. Laminate wood flooring is made from compacted wood, giving them the extra resistance they need to repel the scuffs and scratches that occur over time. Additionally, the protective laminate coating prevents moisture from slipping under the floorboards, which saves you money in the long run as you won’t need to endure repair or replacement costs. Laminate plank flooring is a great choice for homes with high traffic and rooms prone to water, such as kitchens and bathrooms. Young families and homes with pets will benefit from the strength of laminate floors. Our collection of laminate floors comes in diverse aesthetic options. When you install laminate flooring, you are picking a floor that can withstand scuffs while still looking beautiful. 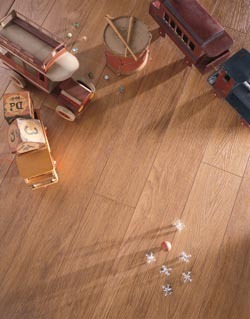 Laminate flooring is able to imitate or replicate virtually any material or image you desire. A high-resolution image is placed on top of three layers to create a beautiful aesthetic. Our store offers a wide range of different photo finishes that mimic the look of tile, stone, and hardwood flooring materials. After going through the selection process for your new laminate flooring, leave the rest of the job to our experienced contractors. We offer full laminate flooring installation services for each of our products. By working with us for your installation, you can trust that your project will be completed the right way the first time. We deliver a top-quality result for spaces of all sizes. From bedrooms to kitchens, any room will stand out when it is outfitted with a new set of flooring. Our laminate flooring installation professionals are trained to work with every product we carry in our store. We offer endless product and service options to help you modernize your home without overspending. Whether you have chosen laminate wood or tile, we have you covered with our services. We work hard to deliver the leading standard of service with the latest technology and equipment available. Are you in need of laminate flooring installation by qualified and experienced professionals? Look no further than our staff. Our skilled and qualified installers utilize responsible methods and the latest technology to prevent dust and other debris from spreading in your home when removing old flooring. This helps protect the health of you, your family, and your pets when replacing your current floors. Having your flooring installed by our team of specialists is the best way to ensure your floors are laid and acclimated properly, so they last for many long years. It is important to remember that laminate flooring materials take a little time to acclimate to the humidity and average temperature of your home. Our special method of preparation helps these floors remain smooth and flat for decades so that you can enjoy the look and feel of the laminate without stressing over performing repairs or maintenance. Contact us to learn about our inventory of laminate flooring for every room in your home. Our laminate wood and laminate tile flooring are available throughout La Mesa, Santee, Alpine, San Diego, and El Cajon, California.